“We are a participant in the Amazon Services LLC Associates Program, an affiliate advertising program designed to provide a means for us to earn fees by linking to Amazon.com and affiliated sites.” This site contains affiliate links. 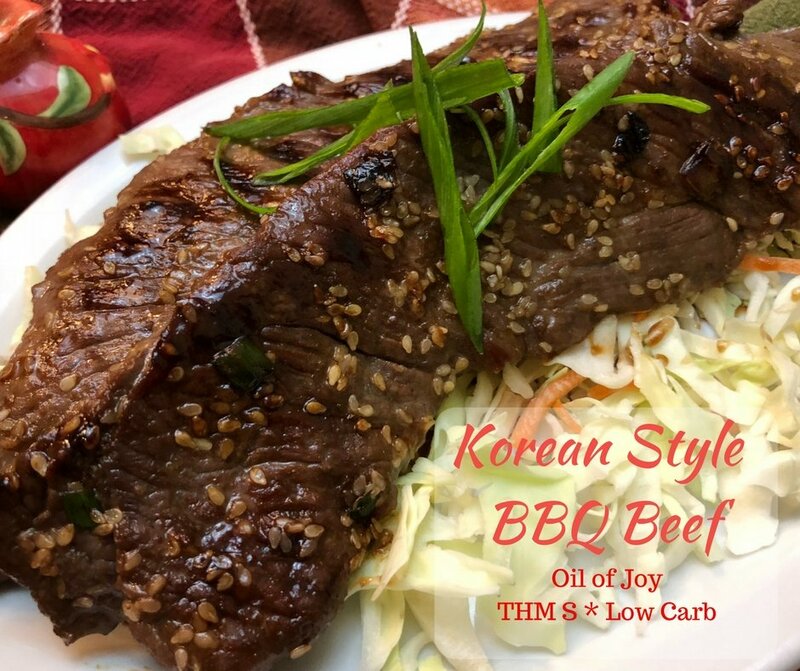 For such incredible flavor, this Korean style BBQ beef comes together so quickly and easily! I love a dish that appears and tastes like I have put a lot of work into it, yet it really took me minutes of prep to have a wonderful dinner on the table for my family! I am a big fan of sweet and savory combinations, thankfully with Trim Healthy Mama, I am able to enjoy these without the added sugar in my diet! By using low glycemic sweeteners such as THM Super Sweet Blend , or another wonderful option such as the Pyure linked below, I can enjoy my savory/sweet dishes and keep to my healhty eating plan! Whether a Trim Healthy Mama, or if you are on a low carb/keto diet, these sweeteners are a fabulous addition! My house is ALWAYS stocked!! Well it does help that I run an actual THM store from home….so I have well stocked cupboards lol! Advantages!! My favorite side dishes for this dish is coleslaw! I love making the recipe from the cookbook, or I also enjoy a simple soy sauce, ACV and a bit of sweetener. I also enjoy this with some sauteed miracle rice! No carbs, keeps this an S, or nice and low carb/keto friendly! This dish has a simple marinade, it comes together so quickly, I place the meat in a tupperware and walk away! Today when I made it I had a lot on my calendar, this was so easy to put it together this morning and forget about until about a half an hour until dinner needed to be done! When it is time to cook you have a couple of options! If you feel like getting outdoors, this is wonderful on the grill! Fire it up, when it’s hot, place the beef on the grill, just a few minutes each side. It’s thin, it will cook pretty quick! Probably around 5 minutes per side! However, I did not feel like going outside into the rainy and dreary weather! I pulled out my Calphalon grill pan, pictured above and gave it a bit of a preheat prior to placing the beef in! So easy! I certainly do hope your family enjoys this dish as much as mine has! I definitely plan to keep this in the monthly routine! Optional sprinkle of red pepper flakes if you like spicy! In medium bowl combine the soy sauce, sesame oil and sweetener. Use 1T super sweet blend, more for other sweeteners that are not as sweet. (Or more if you like sweeter savory dishes!) Mix well until sweetener is well incorporated. Add in the green onions, sesame seeds, garlic cloves and peppers. When ready to cook, pre heat BBQ or grill pan, place meat on, it should sizzle when it hits, cook approx 5 minutes per side! Quick and easy! Add a side salad, cabbage salad, or any other low carb veggie you enjoy! Thanks for sharing . I’m looking forward to trying this with my family!